Two Sunflower League foes will meet in a rematch as the Lawrence Lions travel to face the Olathe North Eagles in the second round of the Class 6A playoffs. The Lions are coming off a 28-27 win over Blue Valley Northwest in the first round. Blue Valley Northwest scored with 1:31 left but elected to go for the two-point conversion. Lawrence defenders Sam Bart and Caleb Mondi stopped Blue Valley Northwest’s Jackson Heath short of the goal line, and the Lions held on for the one-point victory. Quarterback Dante Jackson led Lawrence, rushing for 143 yards and a touchdown. Angel Garcia and Hunter Krom added 123 yards and two touchdowns, and 89 yards and a touchdown, respectively. On the season, Jackson has rushed for 1,132 yards and 11 touchdowns. Lawrence had lost three of its previous four games before beating Blue Valley Northwest. However, the Lions have faced strong competition. Lawrence’s losses have been to Lawrence Free State, Shawnee Mission East, Lee’s Summit West (Mo. ), and Olathe North. The Eagles defeated Lawrence 33-28 during the fifth week of the season. In that game, Olathe North defensive back Joey Rudolph intercepted a pass on a third-and-goal with about a minute remaining to hold on for the win. Arland Bruce led Olathe North with 191 yards rushing and two touchdowns on 17 carries. Jackson passed for 126 yards and a touchdown, but he also threw the interception late. Olathe North is on a five-game winning streak after starting the season with a 1-3 record. The Eagles topped Blue Valley West 14-7 in the first round. Bruce, a freshman, has rushed for 574 yards on the season, including 112 yards last week against Blue Valley West. Garden City makes the 311-mile trip east to face Topeka in the Round of 16. Garden City opened with a 7-0 home win versus Washburn Rural, while Topeka earned a 61-6 victory versus Wichita South. Garden City has outscored teams 198-102 against the No. 25 strength of schedule in Class 6A, while Topeka is at 457-156 versus the No. 27 SOS. Topeka ranks as the top 6A scoring offense, slightly ahead of high-octane Wichita Northwest (454) and Derby (433). Garden City stands second in scoring defense, trailing only Manhattan (94 points allowed). Garden City won the WAC for the second straight year after it replaced more than 90 percent of its rushing yards from quarterback Jesse Nunez and running back Peyton Hill. Standout linebacker Zeke Herrera graduated, too. Garden City has passed more often this year with a conference-best 1,504 yards. The Buffs were last in the conference with 987 rushing yards and averaged just 277 yards a game, second-worst in the conference. Garrett Doll completed 104 of 211 passes for 1,463 yards with a 14/9 TD/INT ratio. Quinton LaPointe has 710 rushing yards and seven TDs. LaPointe didn’t play against Rural, and David Arteaga rushed for 72 yards. 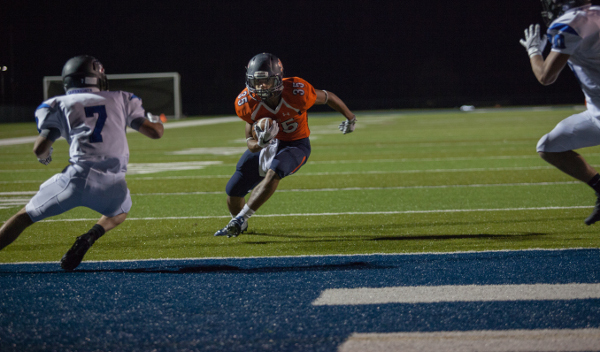 Tye Davis led the conference with 34 catches and six reception scores and was second with 537 receiving yards. However, the defense has been exceptional. Jasper Partin had 10 sacks, twice as many as any other conference player. Brandon Angeles (12 TFLs), Jonathan Gomez (11 TFLs), Demarcus Elliott (11 TFLs) and Ethan Crone (10 TFLs) have enjoyed great years. Both veteran coaches – Brian Hill for Garden City and Walt Alexander - have consistently led their teams to the playoffs. However, the coaches have not had many deep trips. Topeka High has one playoff win in school history back in 2012, leading to a quarterfinal showing. Garden City reached the semifinals in ’13 and the quarterfinals in ’11, its farthest advancement since ’05. Garden City has rarely faced an eastern school and this is the first matchup against Topeka since at least ’04. Last season, 9-0 Buffs squad took a big home 42-7 loss to Free State in the Round of 16. In ’06, Garden City fell 21-18 to Manhattan. Topeka’s offense averages 348 rushing and 148 passing yards a game. Sophomore Ky Thomas is one of the state’s top underclassmen with 144 carries for 1,672 yards and 23 scores. Thomas led the Centennial League in rushing yards, scoring and total offense. Sophomore quarterback Da’Vonshai Harden, a Highland Park-transfer, has completed 51 of 93 passes for 1,258 yards with a 19/3 TD/INT ratio. Manhattan, Topeka High and Shawnee Heights shared the league title with 5-1 marks. Garden City has had a nice season, especially replacing all the offensive skill players. Garden City’s defense, especially up front, will keep it close, but Topeka and Thomas are very explosive.